Okay, so let's start off with the basic question: What is it? 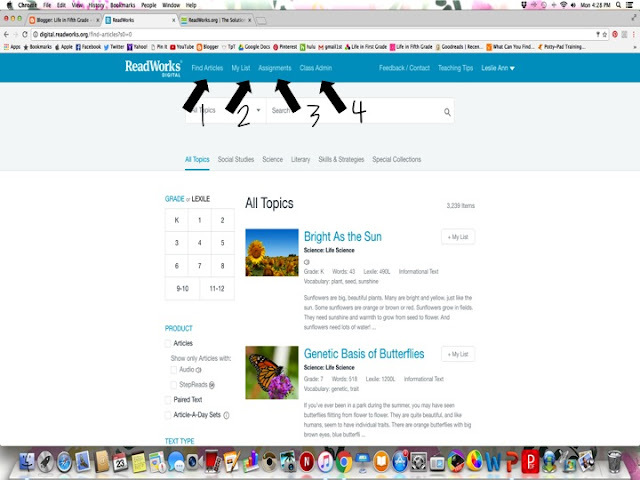 -You can search by text type OR by skills! I LOVE using the skills feature to easily find a passage for whatever comprehension skill we are working on. 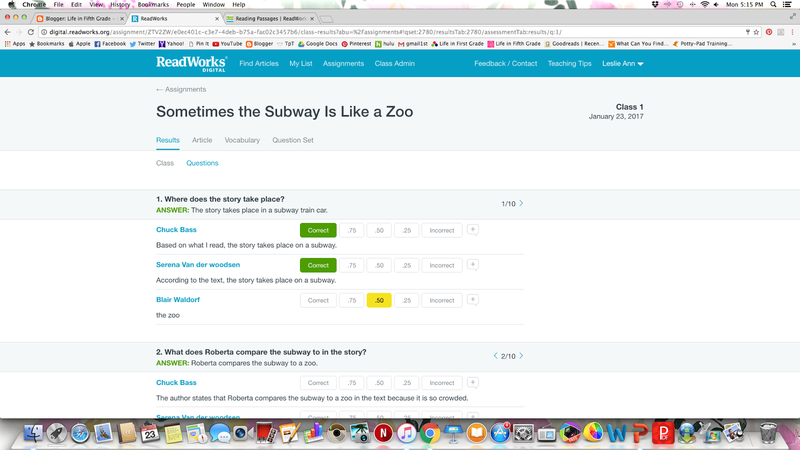 -Some texts have paired texts that include a set of questions that you can use to compare the two texts. 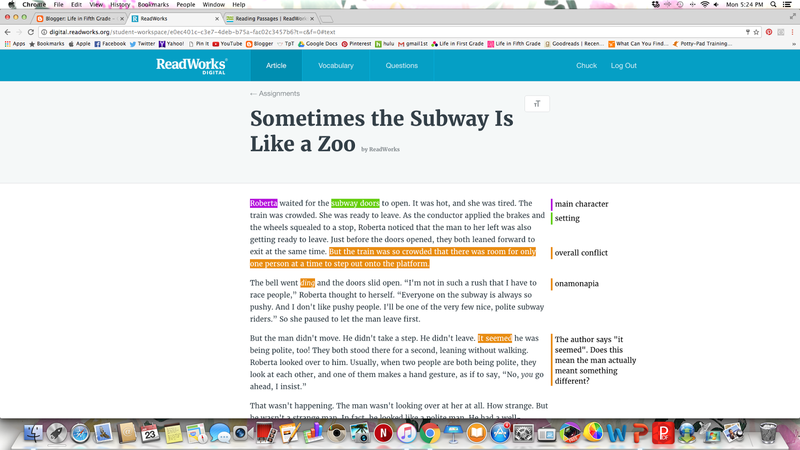 -You can "bookmark" your favorite passages or passages you want to come back to. 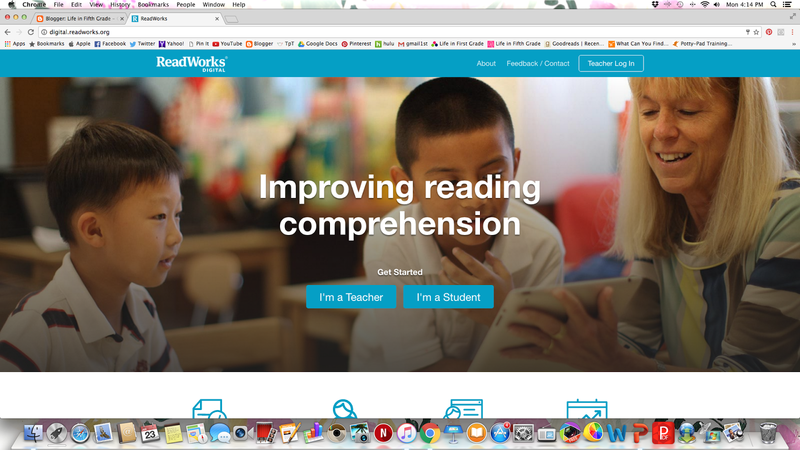 If you have the resources available for each student to work on the digital version, then you MUST visit Digital ReadWorks. Let's talk about this amazing site! Digital ReadWorks is a different site...same company, but a different site. You can visit this site here. 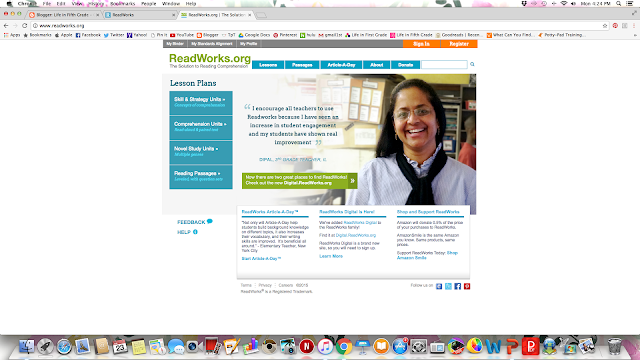 **If you have an account on the original ReadWorks site, you still have to create another account on the digital version. It can be to exact same info though! I'm going to include screenshots of the basic features and my favorite parts of the site. When you log into the site you'll see this screen. The arrows are pointing to what I would call a dashboard. 1) If you want to see all the articles they offer, then click "Find Article". That's the page the screenshot above it taken from. You can sort through and filter out what you want and don't want on the left. 2) If you save passages, they will be in the "my list" part of the site. This is like the "My Binder" part of the original site. 3) Assignments! This is the part of the site that you'll be visiting the most! More on that below. 4) Class Admin- This is where you go to see all of your classes and what students are enrolled in which classes. The kids can highlight the text and make annotations when they click on the speech bubble. Here's a look at a text that has been close read. Now, let's jump into the 'assignments' link and see what's so great about this site. This part of the site is where you can see what you have assigned to what class. You can also see how many of the students have submitted their assignment and how many have not. 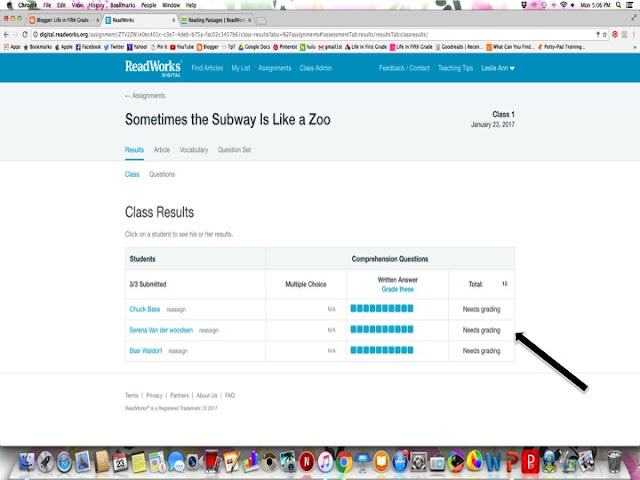 If you click on 'class results' you can see individual scores, as well as the overall class. Once the students have submitted the assignment you can see which ones need grading. 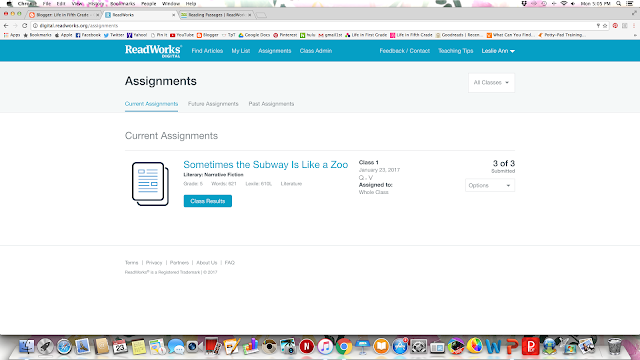 If you click "grade these" under the written assignments, it will take you to each students' work. For this particular passage there were only short answer. This is my favorite part! 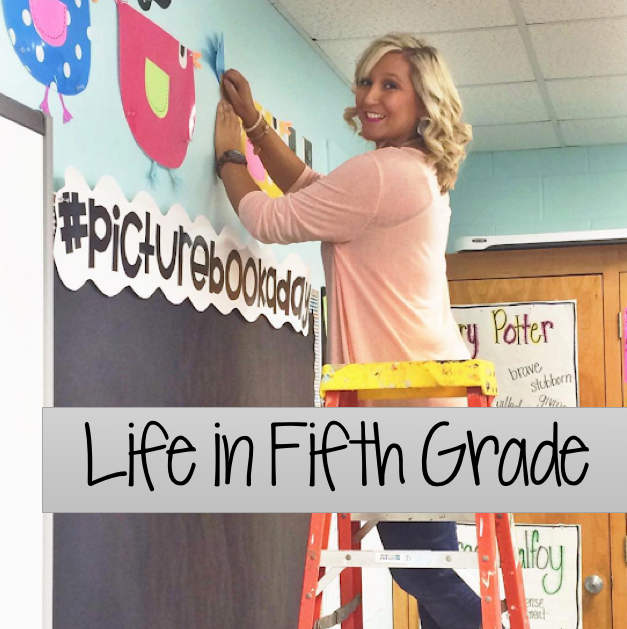 It makes grading short answer responses SO MUCH EASIER! You can see each students' answer and you can simply click "correct", "incorrect" or give partial credit. As you can see, Chuck and Serena answered the question with TBE, but Blair did not. Once all work has been graded, you can see the overview to see which students missed what and their final grade. How great is this FREE site??? I just love how easy it is to use and how much valuable practice it provides the kids! 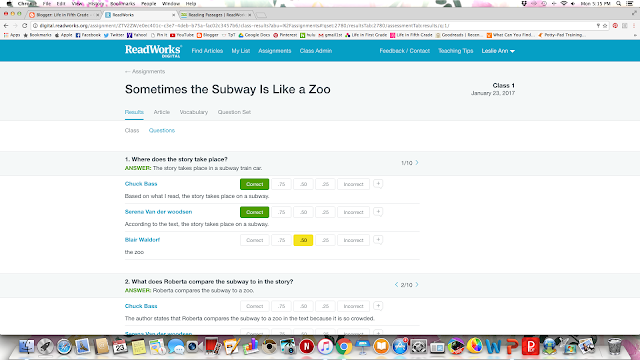 Do you use Digital ReadWorks? What's your favorite feature? Is there anything I didn't mention that I should know about?? Please share! ***This is not a sponsored post! I just really love this site and wanted to share with y'all! I just started using the digital site last week and have taken to the Article-A-Day section. 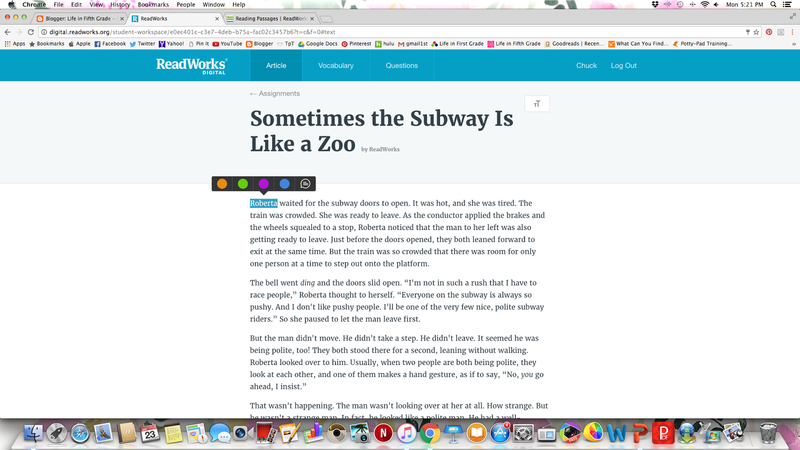 Students read a short story each day (theme related for the week) and write 2-3 things they learned from the article. I was also thinking of adding a bit more for student responses. Thanks for sharing this! I have used ReadWorks in the past but not the digital version. It is a GREAT resource!! I have a question? 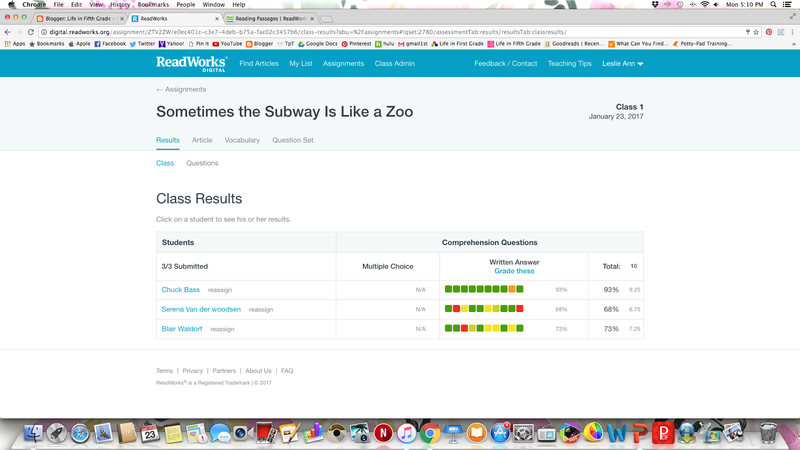 How would you use ReadWorks to progress monitor? How would you use this to progress monitor? Hi. I am just starting to use this site. I am using the paired text feature. We were suppose to start working on it together in class today. However, after previewing it yesterday, some kids went home and answered the questions and submitted the work. How do I do I reopen his site? If I reassign it, will they lose all of the work already submitted or will it open up to the site with their original answers so they don't have to start over?